Editor’s note: PBS NewsHour is a partner with STAT, a new national publication reporting from the frontiers of health and medicine. Oh, what we wouldn’t do for our animal companions! Dogs and cats, in particular, can develop many of the same illnesses, injuries, and disorders that people do. And increasingly, they can get also the same kind of care. Fluffy and Fido getting on in years? Losing their appetite? Aching and whining? Dog treats containing cannabidiol and even the psychoactive chemical THC have grown in popularity in recent years. The Food and Drug Administration has expressed concern over these products, saying research is lacking. Still, some states are going ahead: Nevada has considered a billto allow people to obtain medical marijuana for their pets. Cancer treatment for humans has been advancing by leaps and bounds, and some of those advanced techniques are now being offered to pets, as well. At the cancer institute in Manhattan’s Animal Medical Center, pets get chemotherapy, radiation therapy, and even immunotherapy, a recent approach of activating the body’s own immune system. Treatments can run into the five figures, the AP reported. Getting your companion a checkup does not have to involve making an appointment with the v-e-t and hoping your p-e-t doesn’t know how to spell. Instead, fire up the laptop or smart phone for a virtual vet visit. New apps allow live texting and video-chatting with licensed vets, allowing convenient access to pet medical care. The ancient Chinese therapy of acupuncture is gaining more acceptance to treat everything from pain to behavioral disorders in pets. 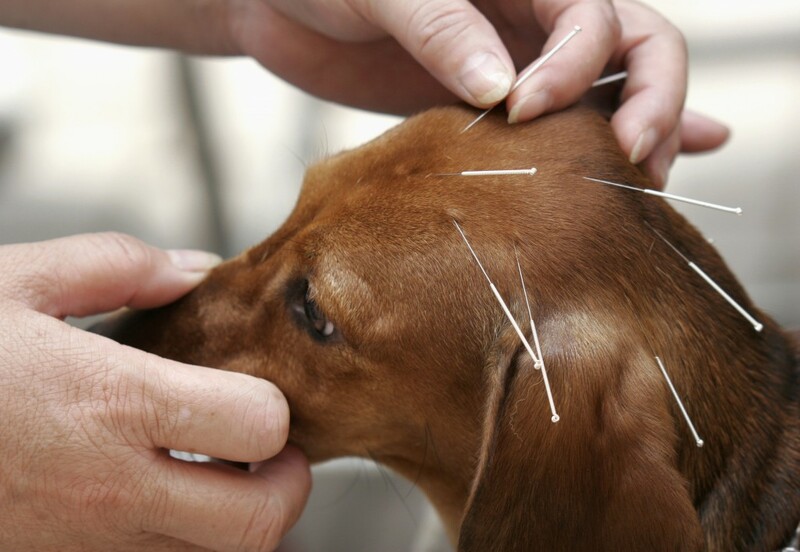 Several veterinary schools and organizations certify vets in the practice of acupuncture. Dogs are the main acupuncture patients but cats, horses, and even birds have gotten the procedure. Corpulent calicos and pudgy poodles run the risk of developing hypertension, diabetes, and kidney disease. And the solution is the same one many out-of-shape humans are using. Exercise trackers, like Fitbark, track dogs’ rest, activity, and playtime. A similar device allows remote medical monitoring of the vital signs of sick pets. Sometimes it takes more than exercise to get an animal back in top form. 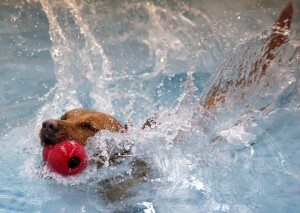 Sprains, arthritis, and other problems can sideline even the most active, playful pet. Physical therapy uses equipment like balance boards and heated swimming pools to rehabilitate hurt dogs, and a wheeled walker lets a dog or cat keep moving while she’s healing. Dogs have different sources of anxiety than humans, but they respond to a common treatment: Prozac. A recent study found that dogs with separation anxiety were less distressed when given the antidepressant along with behavioral therapy. Some pampering might also help de-stress a cranky pet. Pet spas are cropping up in luxury condo buildings, offering pet treadmills, bone-shaped pools, and cots for nap time. After that, a nice bath, a good brushing, and a cute haircut can make all the difference in a pet’s attitude. The raw food trend for animals, like its equivalent for humans, claims to be based on the way their ancestors ate in the wild. Brands such as BARF Dog Food push these diets as the best for pets. However scientists have cautionedthat sometimes homemade raw diets don’t include all the nutrients animals need. This article is reproduced with permission from STAT. It was first published on Feb. 12, 2016. Find the original story here. Leah Samuel is a staff reporter for STAT. A journalist for over 25 years, Leah’s work has appeared in newspapers and magazines across the country, including Harvard Magazine, Labor Notes, The Chicago Reporter, and PublicSource.org. Leah is also a film fan, history buff, science nerd, and trivia nut. When she's not working on a story, she frequently replaces her notebook and pen with yarn and a crochet hook.